After a nice long break with the kids out of school and a trip to my parents’ house, we are slowly settling back into the routine of the new year. The kids are both back in school today (finally!) 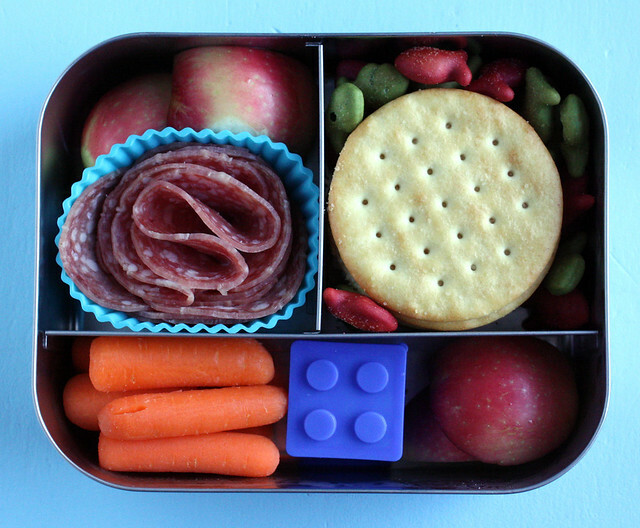 and it’s time to play catch-up on our bento lunches. 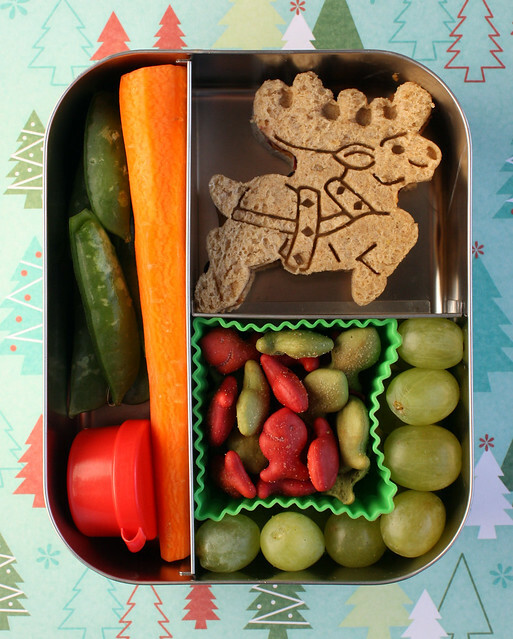 This bento of Augie’s had a reindeer theme. I started off with a reindeer pb&j sandwich, then added a big carrot and some snap peas for the reindeer to munch on, per Augie’s request. The little red tub held hummus for dipping. I finished this lunch off with red and green goldfish in a square silicone cup and a few green grapes. This was packed in our Lunchbots Trio. 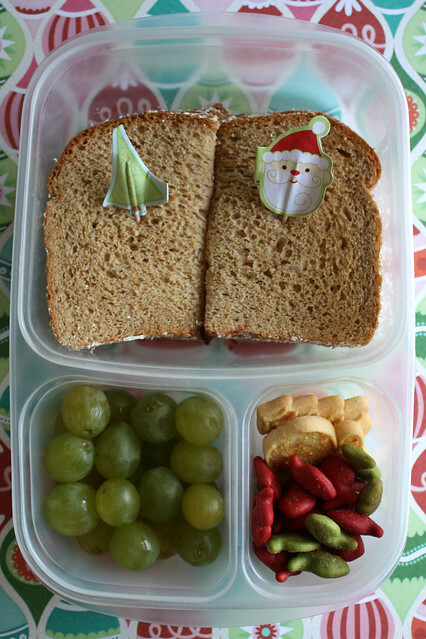 Wyatt’s lunch was simple: jelly sandwich with a couple of Christmas picks for color, green grapes, goldfish and two butter cookies. This was packed in an EasyLunchboxes box . 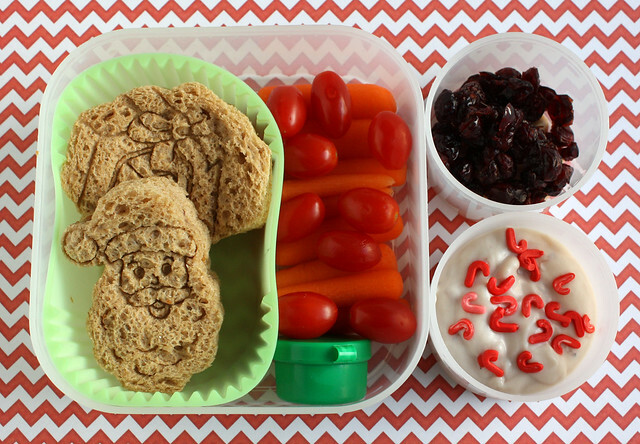 On Wednesday, I put Augie’s lunch in the Yubo box: Santa and gift pb&j sandwiches, carrots, tomatoes, hummus, dried cranberries and soy yogurt with candy cane sprinkles. 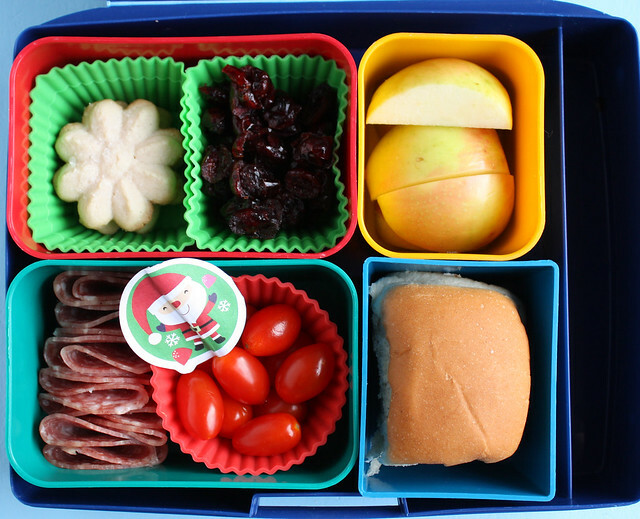 Wyatt had spritz cookies, dried cranberries, apple chunks, a dinner roll, grape tomatoes and salami all packed up in our Laptop Lunches bento box. 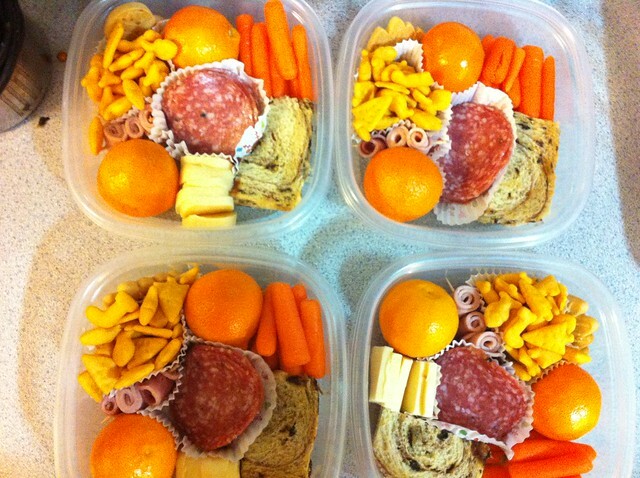 On Thursday, Augie had apple pieces, salami, crackers, carrots, hummus and more apples. No bento for Wyatt this day. He must have had school lunch. 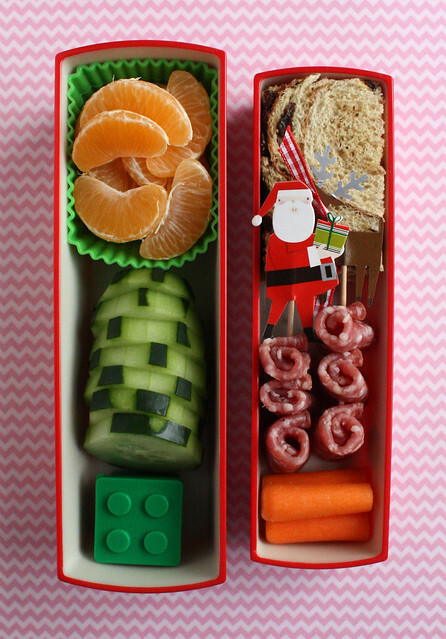 Augie’s last Christmas bento of the year was packed in my favorite double-decker bus box: oranges, cucumber slices, hummus in the Lego tub, cinnamon raisin bread, salami roll-ups on cute Santa and reindeer picks , and a few carrots. 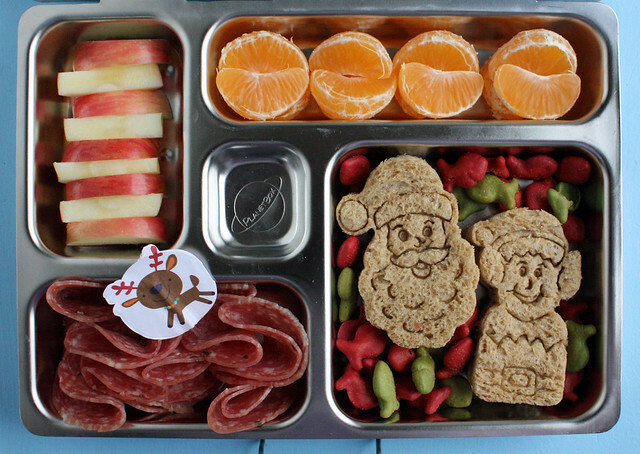 Wyatt’s lunch was packed into our PlanetBox : candy cane striped apples (really just sliced apples that I packed alternating the skin and flesh sides up), clementine slices, Santa and elf jam sandwiches, Christmas goldfish, and salami. 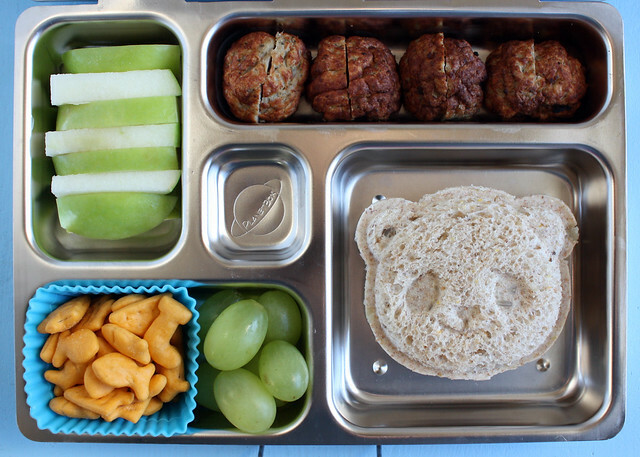 Augie went back to school on Wednesday and had this: apple slices, meatballs, a pb&j panda pocket sandwich made with this cutter, grapes, and goldfish crackers. It was my first try making a sandwich with the cutter and my bread had seeds and stuff in it so the face didn’t come out looking very nice, but subsequent experiments have produced hella cute pandas, so look for those to make an appearance soon. Wyatt caught the cold that was running through our family the day before he was supposed to go back to school (aaaargh! ), so he didn’t have a lunch. Yesterday I made this green and orange lunch for Augie. I didn’t realize it at first but once I did, I decided to go for it. 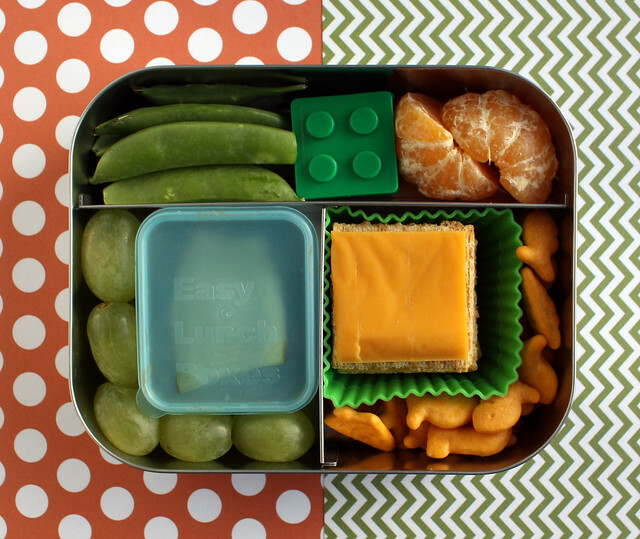 The green things were: snap peas, hummus (in the Lego box), green grapes and dill pickle chunks that I packed into a lidded EasyLunchboxes mini dipper . For the orange side, I had a clementine, Triscuits with soy cheese and goldfish crackers. Wyatt was still home sick. Today, Augie asked me to pack his lunch in the panda bento box . 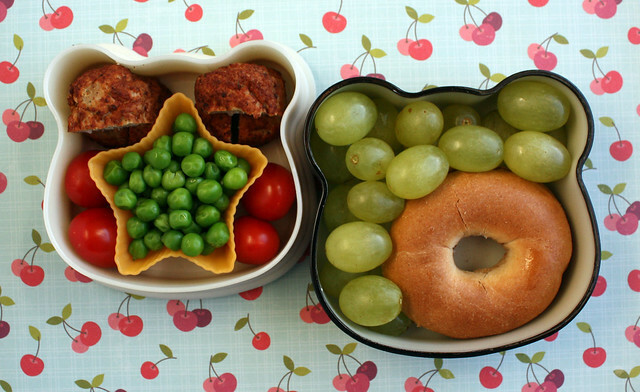 He had turkey meatballs, peas, grape tomatoes, green grapes and a bagel with butter, cinnamon and sugar inside. Wyatt finally went back to school today, but I have to confess I was super crabby about making his lunch because he’s been so dang picky lately (even before he got sick). It felt like a waste of time to pack his lunch because I’m pretty sure that everything I thought up to put in his lunch would come home un-touched. He swore he would eat this meal though, so we’ll see what it looks like when he comes home. 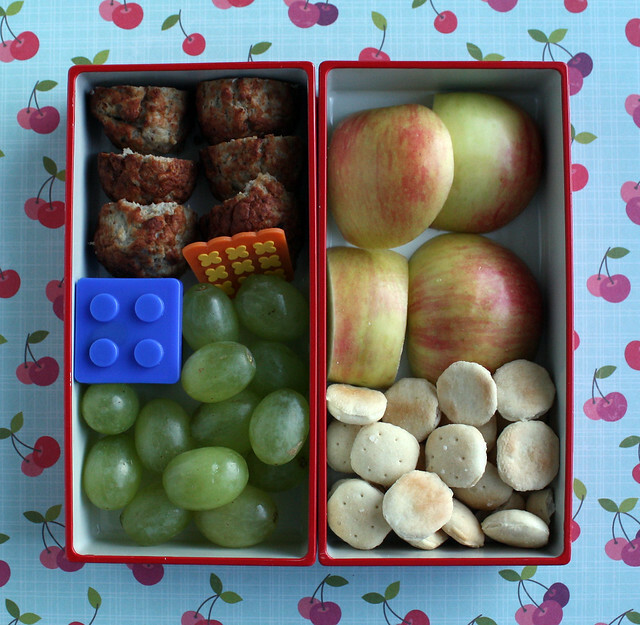 I gave him turkey meatballs, ketchup (in the blue Lego box), green grapes, apple chunks and oyster crackers. This was packed in our Lego bento box.